More Information A selection of beautifully designed Bellevue Beta Heat single panel colosseum radiators that add warmth and style to any modern day suite. Bellevue Beta Heat 1600 x 240 Single Panel White Radiator - Style: Contemporary - Height: 1600mm - Width: 240mm - Projection: 92mm - Output: 1781 BTUs - Materials Specification: Steel - Number of Rails: 4 Vertical rails - 50 x 25mm - Gross Weight: 11.35Kg - Net Weight: 9.35Kg - Finish: White - Includes: Wall brackets and fixings - Excludes: Radiator Valves - Accreditations Testing: Finish is provided by a 3 stage process, finalising in a durable powder coating which is hardened by oven baking to high temperatures, This unique process provide a luxurious and smooth finish that is resistant to scratching, denting and. A selection of beautifully designed Bellevue Beta Heat single panel colosseum radiators that add warmth and style to any modern day suite. Bellevue Beta Heat 1600 x 240 Single Panel White Radiator. Number of Rails: 4 Vertical rails - 50 x 25mm. Includes: Wall brackets and fixings. Accreditations & Testing: Finish is provided by a 3 stage process, finalising in a durable powder coating which is hardened by oven baking to high temperatures, This unique process provide a luxurious and smooth finish that is resistant to scratching, denting and chipping, Factory ISO9001:2008 compliant quality management system, Tested to and manufactured in accordance with BS EN 442 standards, Safety tested at 15 bar pressure, Compatible for use on all UK heating systems that are tank fed or combination systems. The product can also be installed even if you do not have a central heating system. Please follow the advice carefully in the Heating Element fitting instructions. Bellevue 1600 x 360 Single Panel Radiator. Number of Rails: 6 Vertical rails - 50 x 25mm. Bellevue 1600 x 480 Single Panel Radiator. Number of Rails: 8 Vertical rails - 50 x 25mm. Bellevue 1600 x 240 Single Panel Radiator. Gross Weight: 11.35 Kg. Net Weight: 9.35 Kg. Gross Weight: 15.97 Kg. Net Weight: 13.97 Kg. Gross Weight: 20.59 Kg. Net Weight: 18.59 Kg. Bathroom Waste Pop Up ; Push Button Slotted Waste ; Brass Chrome Plug. Shower Hose Standard 1/2 Bore Chrome Stainless Steel Flexible Replacement 1.5m. Bathroom Waste Pop Up Push Button Basin Sink Slotted/Unslotted Chrome Brass. Shower Kit Adjustable Riser Slide Rail Bar Kit Hose Bracket Round Head Chrome. Bathroom Radiator Towel Rail White 1600 x 360 Vertical Double Panel 5207 BTU's. Flat Low Carbon Steel Radiator ; 14 Vertical Tubes ; 2360 BTU's ; Modern Heating. 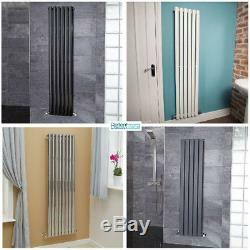 Low Carbon Steel Modern Black Towel Rail Flat Panel Radiator 15 Tubes 1437 BTU's. Flat Stainless Steel Radiator 1800 x 300 Bathroom Heating 1353 BTU's Output. Well deliver your goods straight to your home and place them carefully in a ground floor room of your choice. We are unable to dispatch orders without a valid contact number. Please provide us with a mobile number as we will update you on the status of your order. Wherever possible, we will deliver your order with our Own Van Service. The sooner you can let us know of any problems, the sooner we can resolve them for you. To organise a return, you must first get authorisation from our customer service team. If you do not provide this information, we will not know who you are and will unfortunately be unable to help. Please Note: These conditions do not affect your statutory rights relating to faulty or incorrectly described goods. For further information about your statutory rights contact your local authority's Trading Standards Department or Citizens Advice Bureau. Bathrooms2Buy provide premium quality, on trend bathrooms at cheap prices. Marking down items in sale, across our large portfolio of products means a desirable bathroom at low-cost. A continuous conveyor belt of the latest, on trend bathroom products pass through our Outlet Store at discount prices; as well as current trend, some of our most popular classic ranges too. Our portfolio covers modern baths, showers, suites, toilets, furniture, basins, taps and more, offering a choice of various styles and sizes to suit your interior home. Designing your contemporary home does not just end with bathrooms; we boast a stunning catalog of the latest on trend Heating, Tiles and Lighting at mark down prices. Be sure not to miss out on discounts and build part of your dream home at an affordable price with Bathrooms2Buy. We also have a dedicated customer service team on hand to answer any queries you may have about a specific product or advice and suggestions on the best products for you. Bathrooms2Buy deliver nationwide to England, Wales and Scotland; we even deliver to Ireland! We have two 100,000+ square foot warehouses! With these HUGE stocks we can ensure that all orders can be processed and dispatched promptly. Please Note that we provide product dimensions as approximate and this should be used for guidance only. The item "Modern Luxury Designer 1600 Vertical Towel Radiator Central Heating Column" is in sale since Friday, May 19, 2017. This item is in the category "Home, Furniture & DIY\Bath\Towel Rails". The seller is "bathrooms2buy*" and is located in GB.